Squirrels eat fruit. That’s something I never knew. 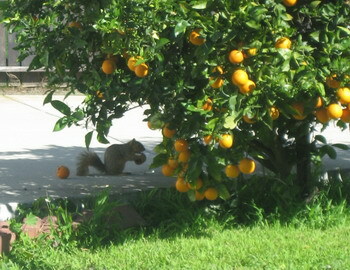 Or is this only a very health-conscious SoCal squirrel? The local squirrel street gang, which are thievin’ little bastards, eat pecans and acorns. I kept finding pecan shells and seed husks on our sidewalk. That wouldn’t have been odd, except we don’t have a pecan tree in our yard. The puzzle was solved one day when I saw one dart from the house across the street to our sidewalk, with a pecan clutched in his mouth. The backyard squirrel gang are just tacky. They like to tease the dogs. They know exactly how high those dogs can jump. So, the squirrels come down tantalizingly low, but just out of reach of paws & teeth. Then they taunt and scold the dogs. Squirrels can really do a good scolding, too. It just drives the dogs mad. 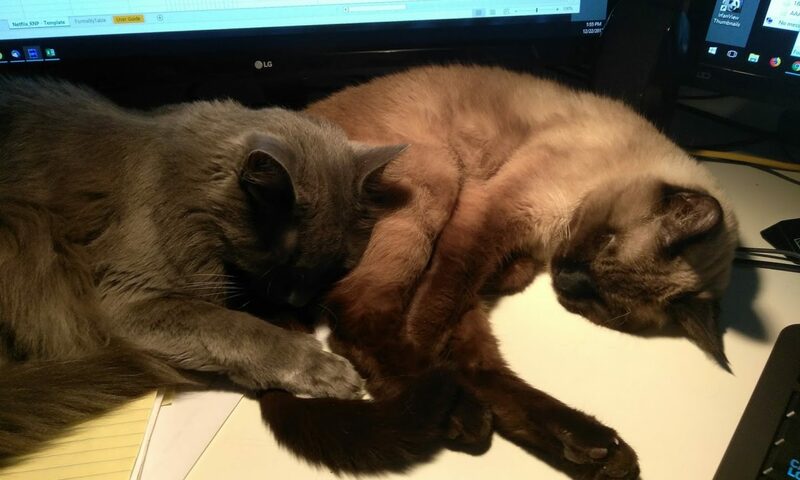 They live in eternal hope that one of the little rodents will lose its balance and fall out of a tree or bush. It could happen. We do not have gangs of squirrels here, the gardens seem to be divided up amongst the bushy tailed ones. “One garden each, please.” Sometimes they meet on the power lines (aka squirrel highway #1); then squirrel war breaks out. Or an intruder sneaks into the tree outside my office – same result, noisy attacks and quite a ruckus, until the territory has been defended.